What if you could remember everything? Gordon Bell and Jim Gemmell draw on their experience from the MyLifeBits project at Microsoft Research to explain the benefits to come from an earth-shaking and inevitable increase in electronic memories. In 1998 they began using Bell, a luminary in the computer world, as a test case, attempting to digitally record as much of his life as possible. Photos, letters, and memorabilia were scanned. Everything he did on his computer was captured. He wore an automatic camera, an arm-strap that logged his bio-metrics, and began recording telephone calls. This experiment, and the system they created to support it, put them at the center of a movement studying the creation and enjoyment of e-memories. Since then the three streams of technology feeding the Total Recall revolution — digital recording, digital storage, and digital search — have become gushing torrents. We are capturing so much of our lives now, be it on the date- and location-stamped photos we take with our smart phones or in the continuous records we have of our emails, instant messages, and tweets — not to mention the GPS tracking of our movements many cars and smart phones already do automatically. We are storing what we capture either out there in the “cloud” of services such as Facebook or on our very own increasingly massive and cheap hard drives. But the critical technology, and perhaps least understood, is our magical new ability to find the information we want in the mountain of data that is our past. And not just Google it, but data mine it so that, say, we can chart how much exercise we have been doing in the last four weeks in comparison with what we did four years ago. 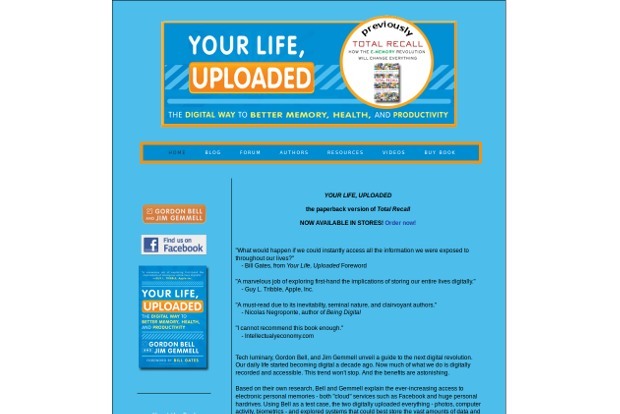 In health, education, work life, and our personal lives, the Total Recall revolution is going to change everything. As Bell and Gemmell show, it has already begun. Total Recall provides a glimpse of the near future. Imagine heart monitors woven into your clothes and tiny wearable audio and visual recorders automatically capturing what you see and hear. Imagine being able to summon up the e-memories of your great grandfather and his avatar giving you advice about whether or not to go to college, accept that job offer, or get married. The range of potential insights is truly extraordinary. But Bell and Gemmell also show how you can begin to take better advantage of this new technology right now. From how to navigate the serious question of privacy and serious problem of application compatibility to what kind of startups Bell is willing to invest in and which scanner he prefers, this is a book about a turning point in human knowledge as well as an immediate practical guide.